After successful concerts with Indonesian gamelan and Chinese erhu (Chinese violin), it's this year Japan's turn to provide a traditional instrument to play along with the Fokker organ. Among the many special Japanese instruments there is the beautiful shakuhachi flute. A major Dutch virtuoso on this instrument is the famous flutist Harrie Starreveld, who is affiliated with the conservatories of Amsterdam and Bremen. 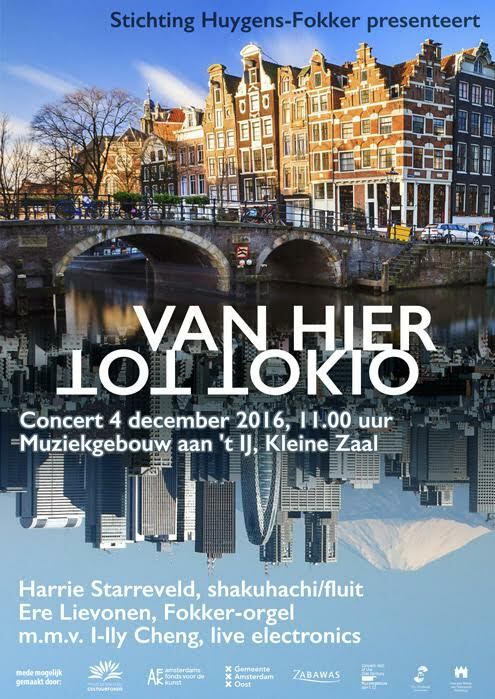 Ere Lievonen, organist of the Fokker organ, will accompany Starreveld, as well as the Taiwanese composer I-lly Cheng (live electronics), who wrote a new piece for shakuhachi. During this concert works of composers based here in the Netherlands and in Tokyo (Japan) will be performed. As sonorous as the instruments are, as colorful this concert will be.